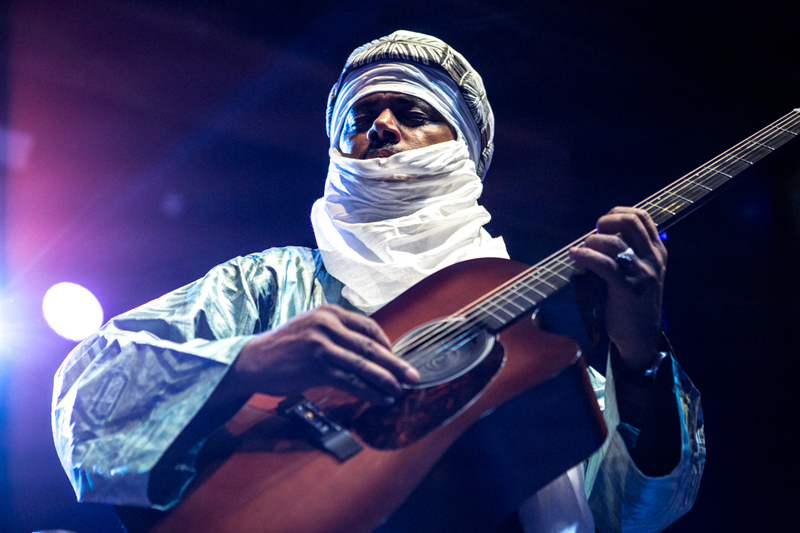 Tinariwen, Tinariwen, Tinariwen- how do we describe the transcendent experience of seeing Tinariwen. 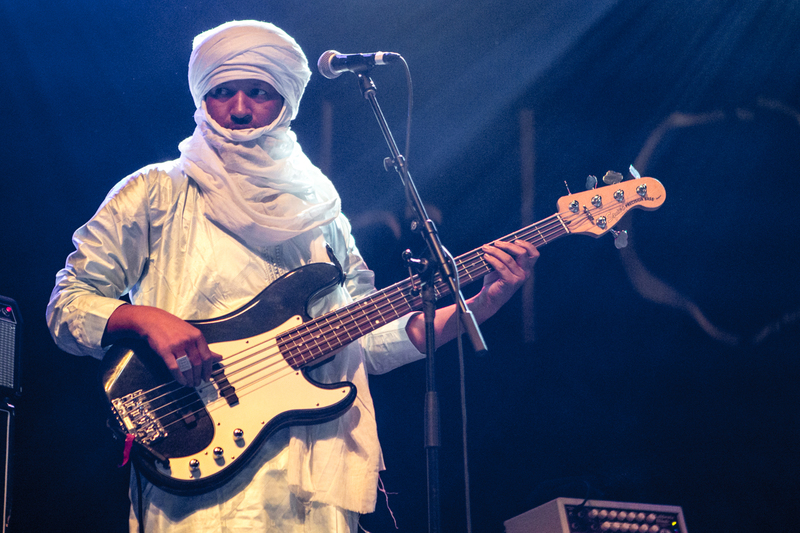 For those of you who have never experienced this band, a bit of background- their founding member and frontman, Ibrahim Ag Alhabib, witnessed his father’s execution at age four after an uprising in Mali in 1963. 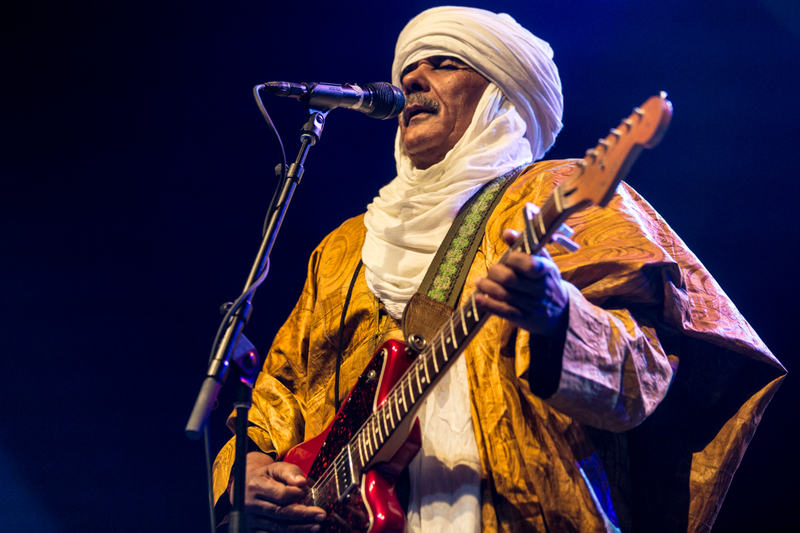 Growing up in refugee camps in Algeria, he built his first guitar from a tin can, a stick, and bicycle brake wire, and he first began to teach himself on this before a local Arab man gave him his first guitar. 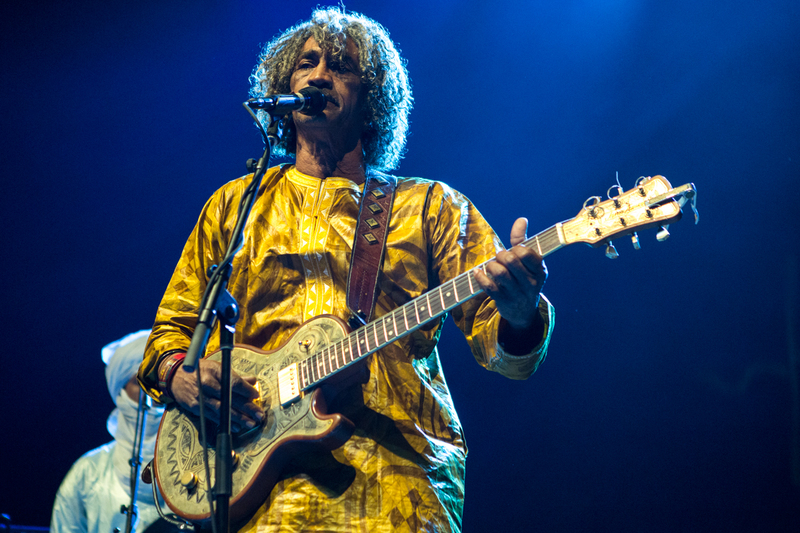 Protest music from all corners of the world formed his, and the rest of the founding members of Tinariwen’s (Alhassane Ag Touhami and brothers Inteyeden Ag Ablil and Liya Ag Ablil in Tamanrasset) inspiration- Moroccan groups, Algerian pop rai, and Western acts like Hendrix, Santana, Presley, and Marley. 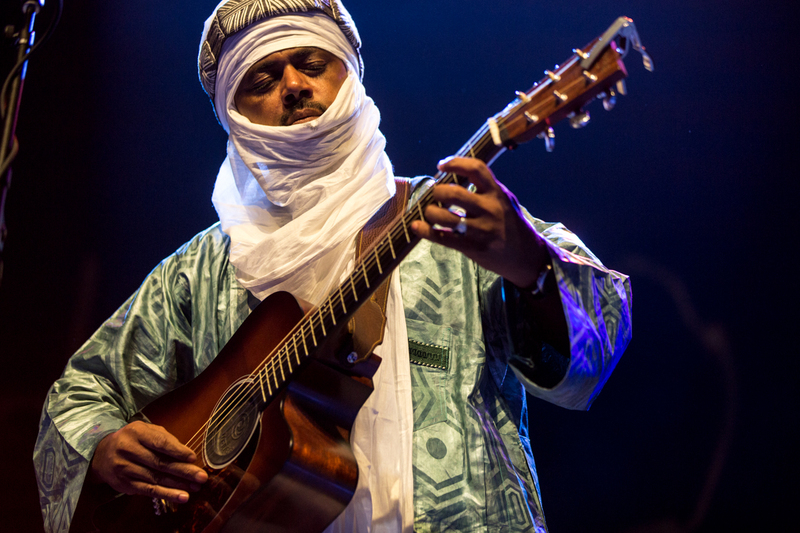 It’s easy to see their influence in the skill and swagger of Ag Alhabib and acoustic guitarist Abdallah Ag Alhousseyni. 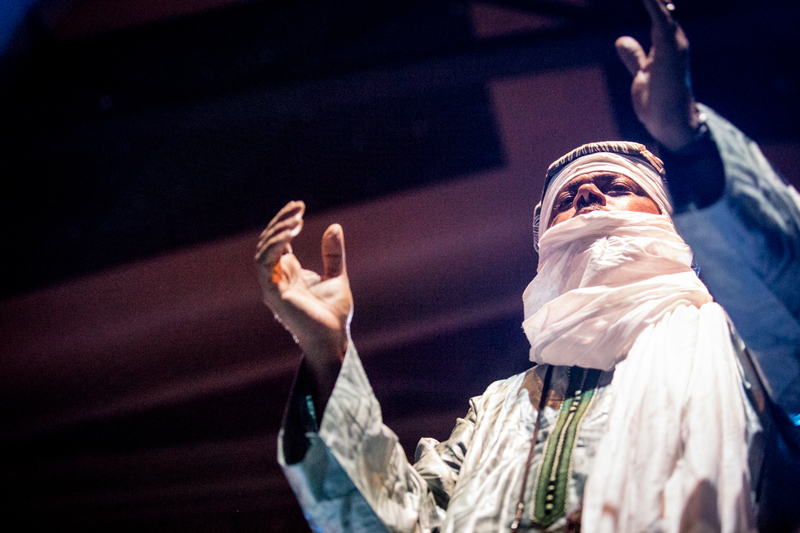 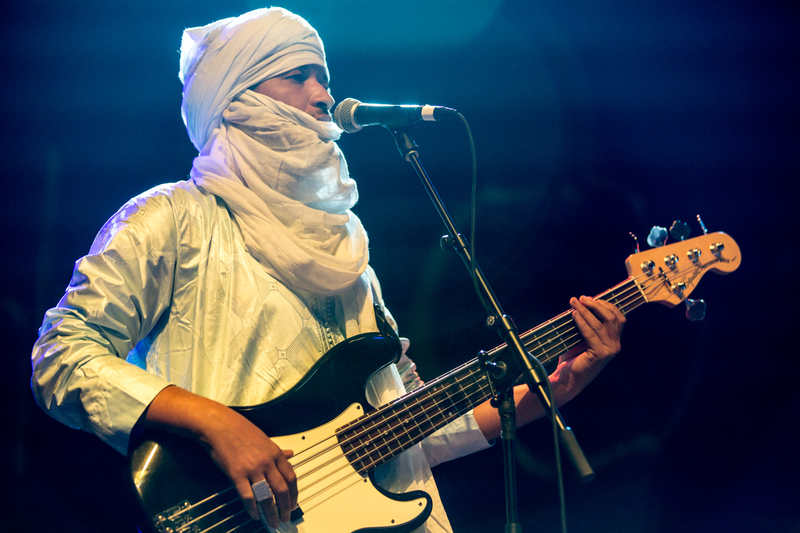 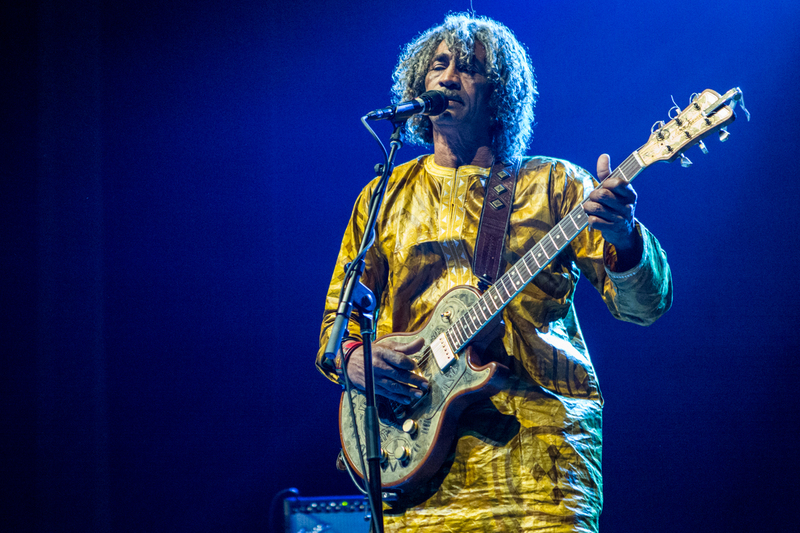 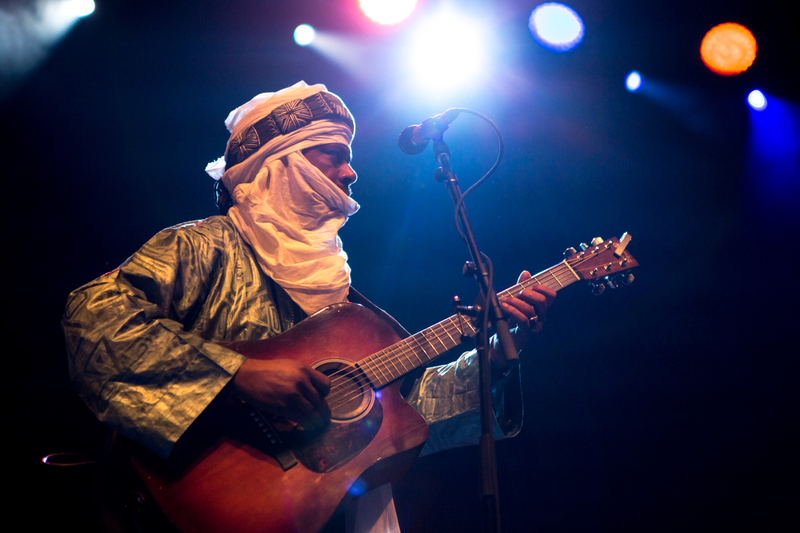 Tinariwen is ultimately a collective of musicians, and it’s rare you see the same touring group twice. 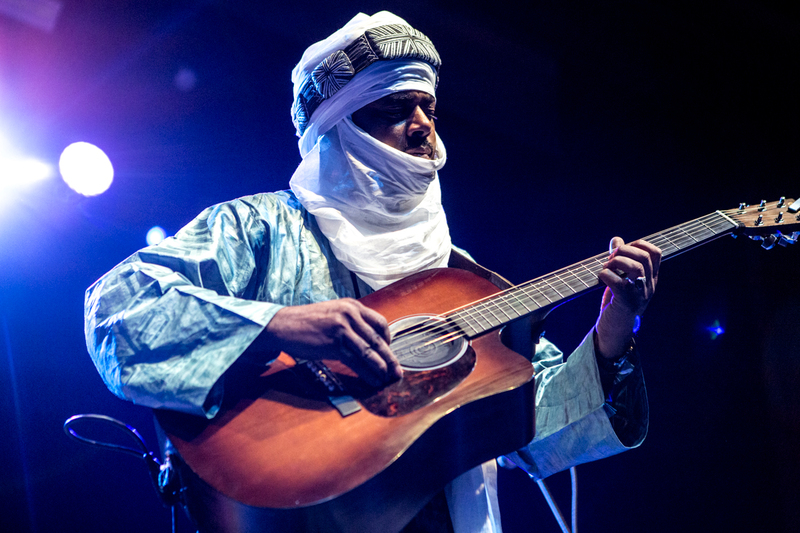 Tinariwen literally means ‘The Desert Boys’, as they were called before they had a formal band name, and it fits this elegant group of musicians, who infuse their native musical style and instruments with Western guitars and rock n’ roll, like a glove. 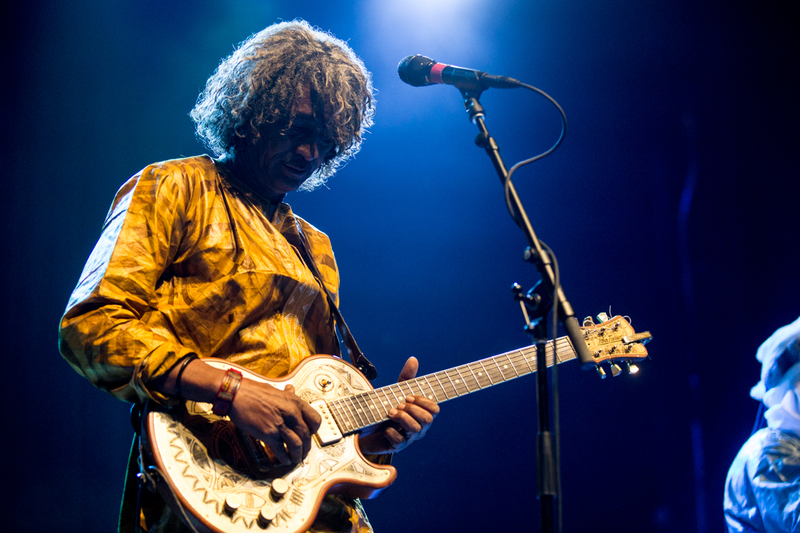 Setting the stage for their UC Theater show was their opener Dirtwire, in matching bolero outfits, playing a super unique mix of gritty Americana and house music. 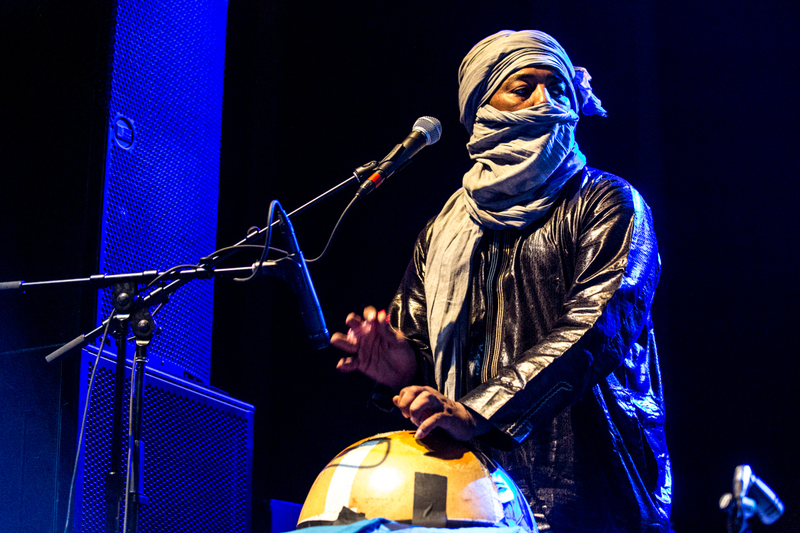 I freaking loved their sound. 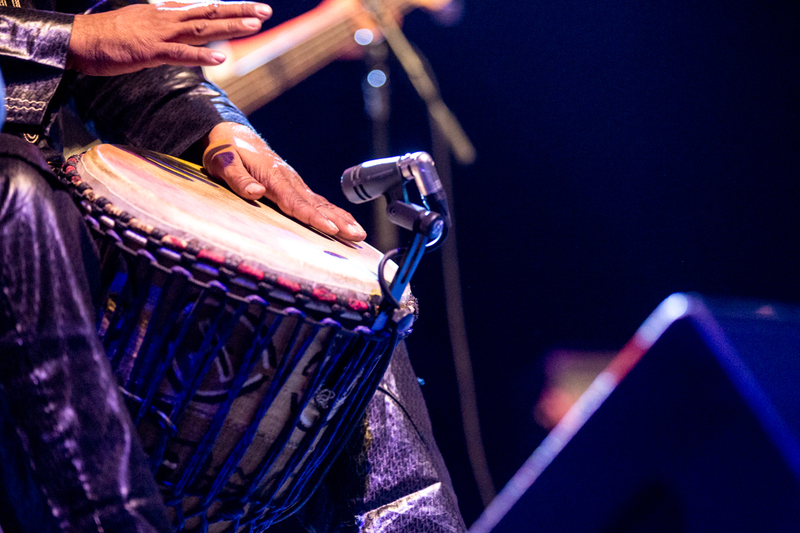 They did an amazing job of amping up the energy of the crowd, but anticipation was already high. 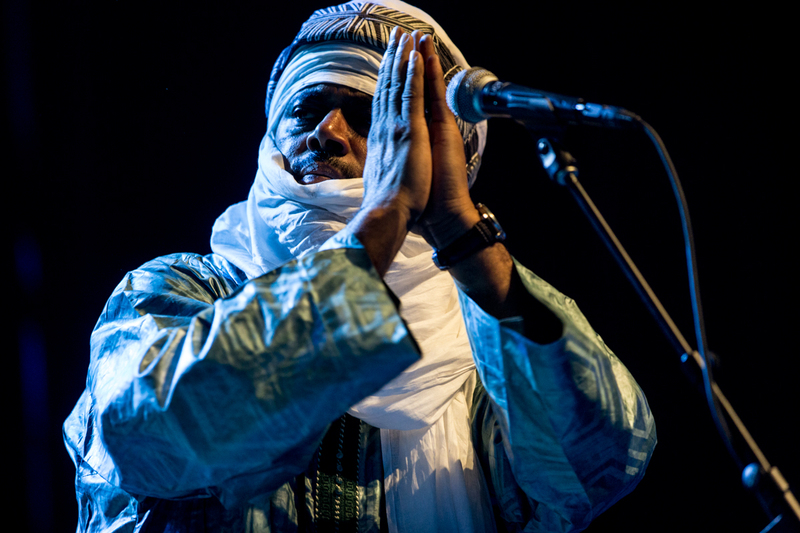 Walking in, next to the basic merch booths, attendees were greeted by a gentleman selling traditional Mali jewelry and handicrafts, beautiful items selling for a few hundred dollars apiece. 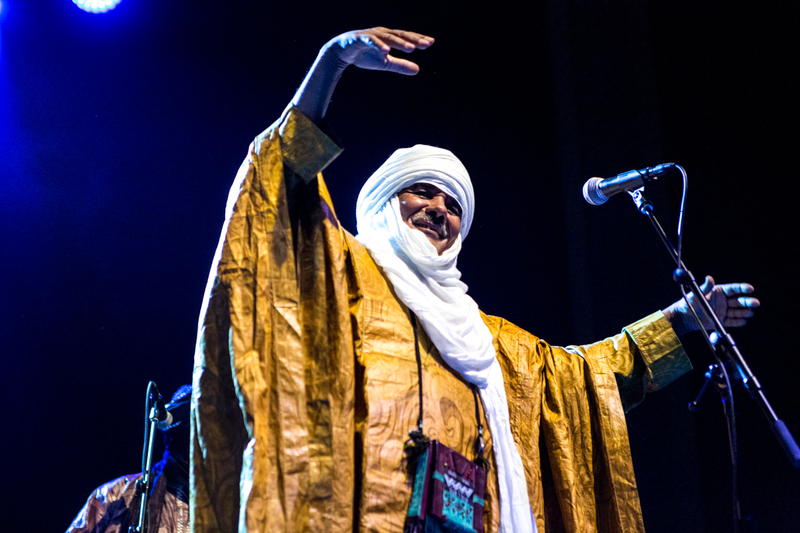 A dance party was already brewing in the back of the bursting theater, much in the same way you’d see acid twirls breaking out at a Dead and Company show, and once the striking visual of the band took to the stage, the celebrations began in full force (as did the lighting up of +/- 3 joints in my vicinity). 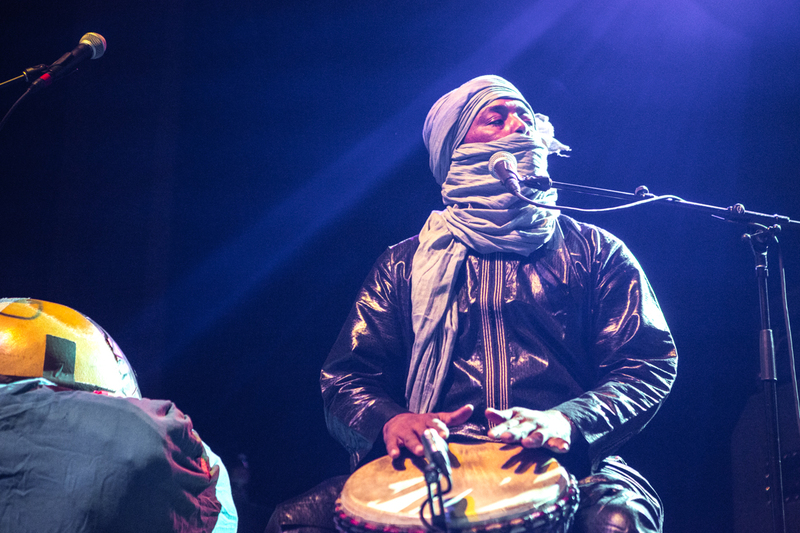 I was blown away by the majesty of this band. 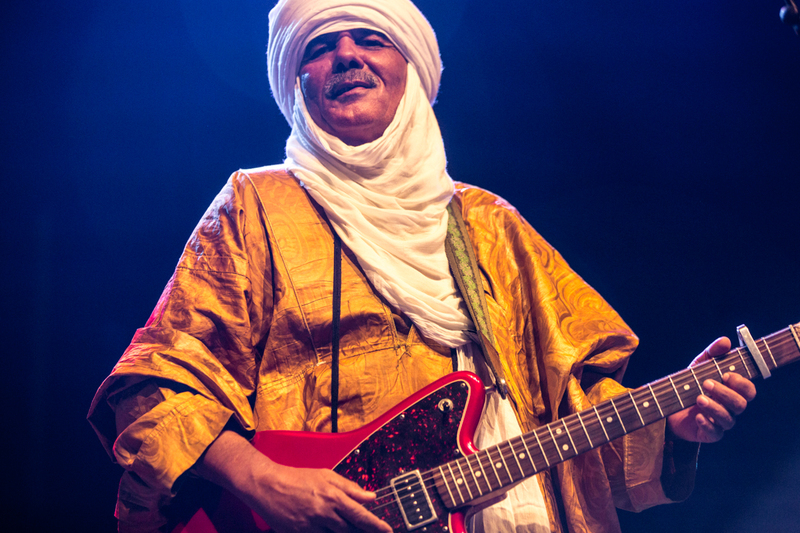 Their musicality and command of the stage is wildly impressive, especially when paired with the radiant joy exhibited by their dancing golden-robe wearing backing singer. 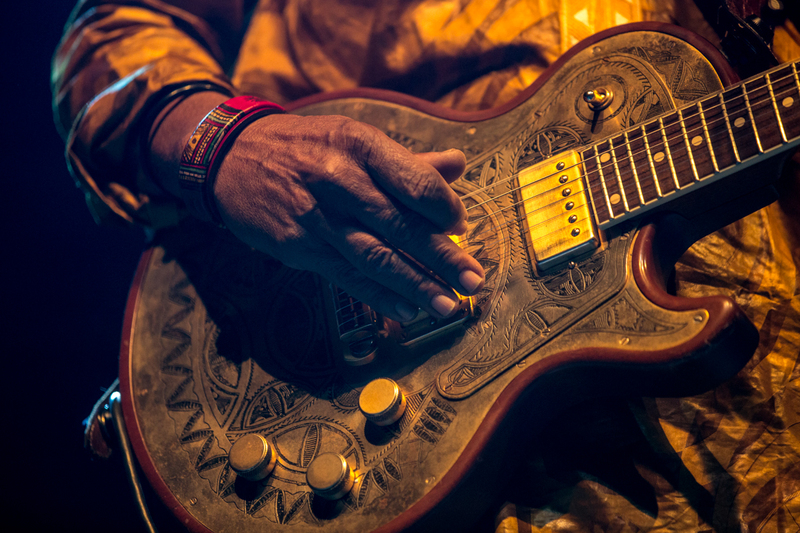 Everyone who picked up a guitar absolutely shredded through soIos, making complicated picking patterns look effortless, all while a pounding drum maintained a vice grip on the beat. 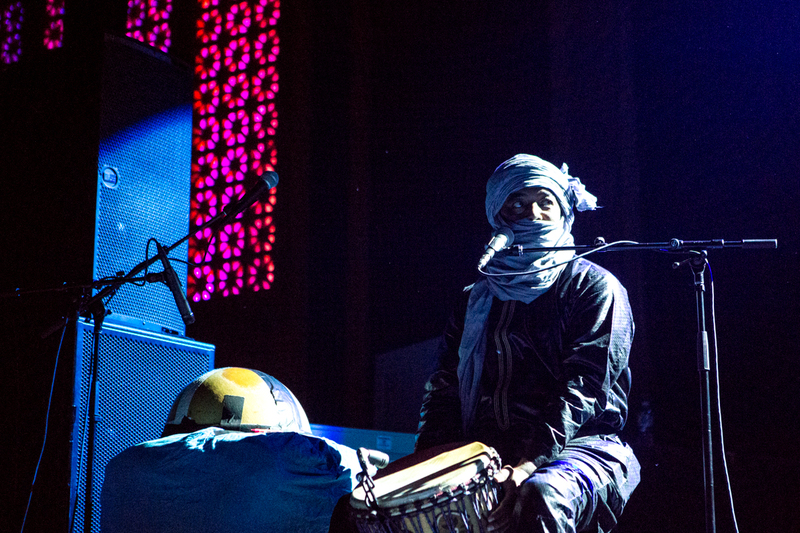 I found myself grinning from ear to ear and swaying with the music nonstop through their set, feeling it in my bones. 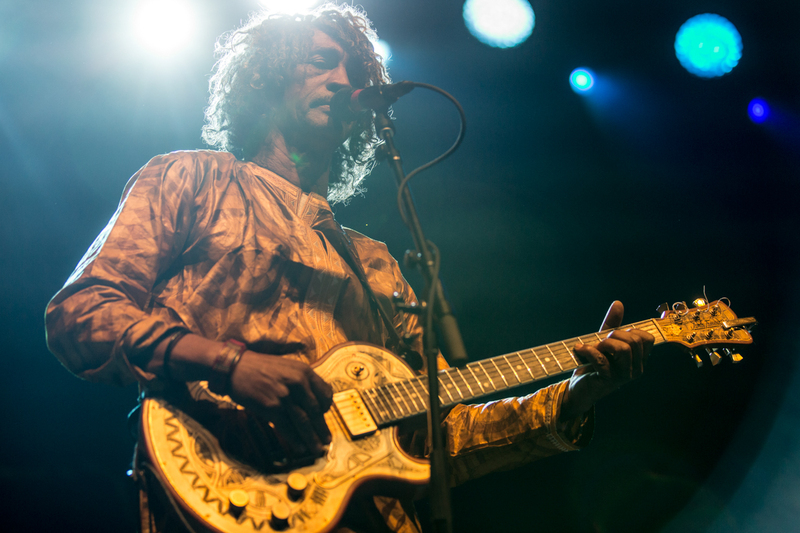 I found myself grinning from ear to ear and swaying with the music nonstop through their set, feeling it in my bones. 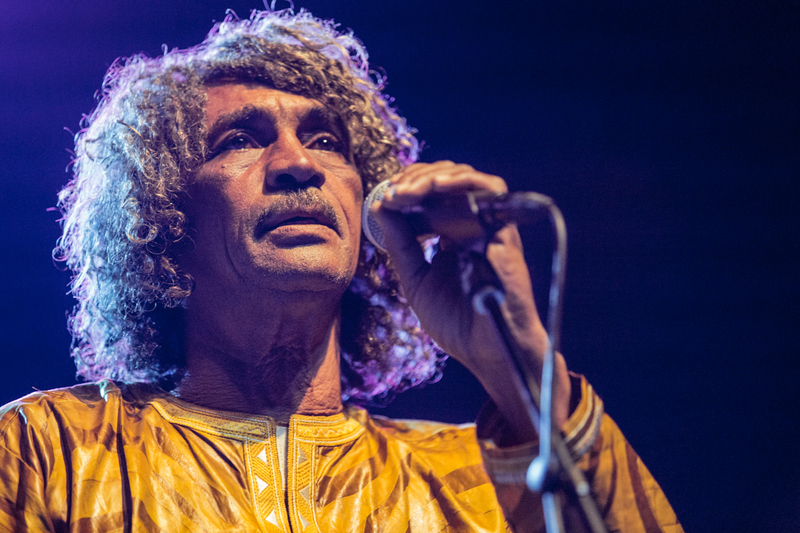 When Ag Alhabib takes the stage, the crowd goes wild- he is a charismatic, magnetic presence, and it’s his songs that bring their performance to the height of its power. 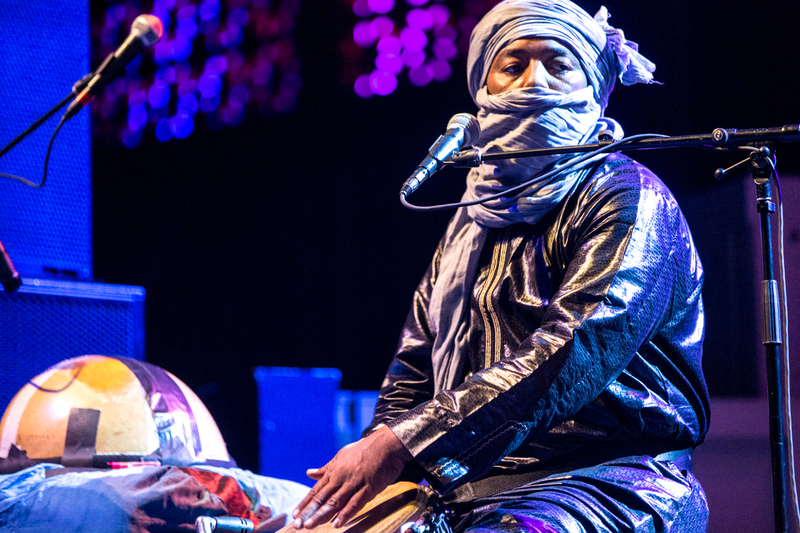 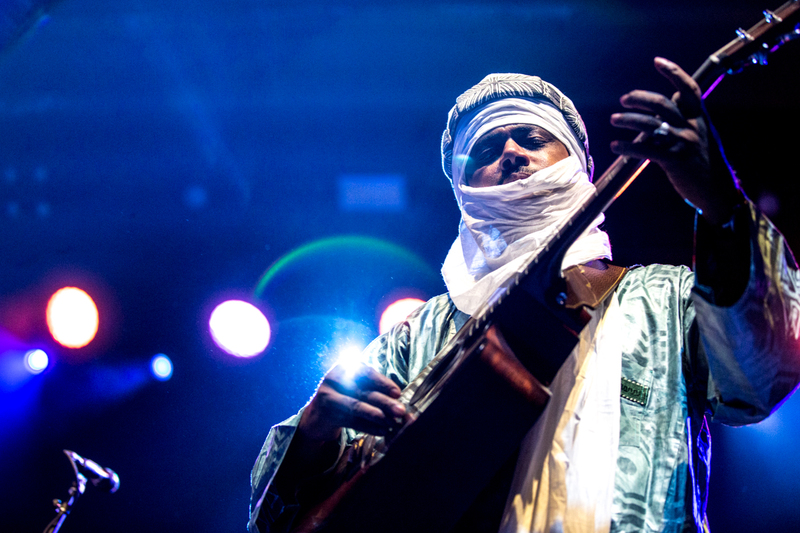 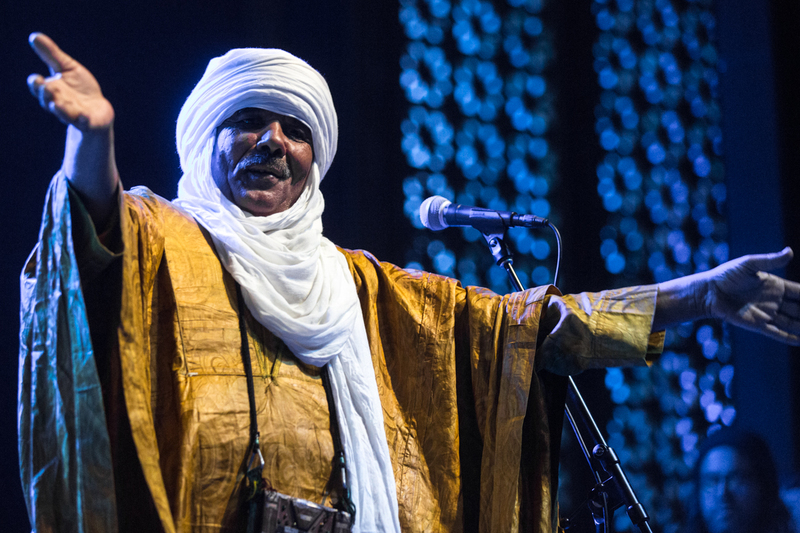 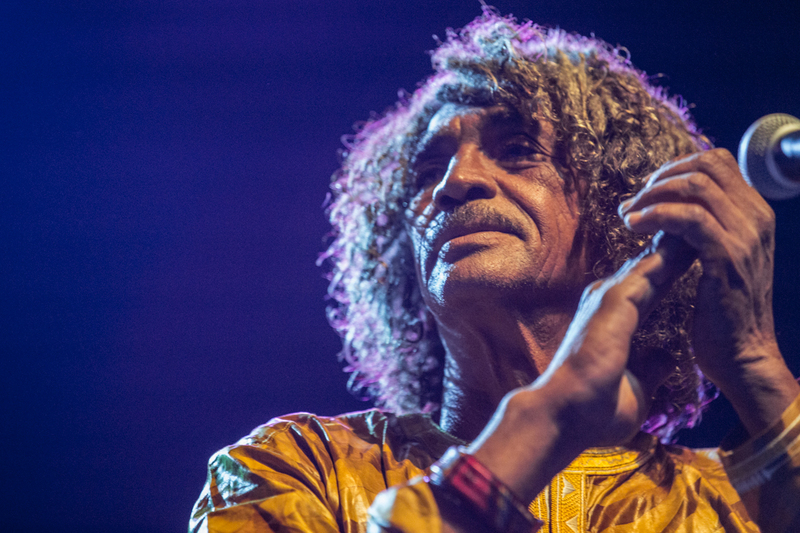 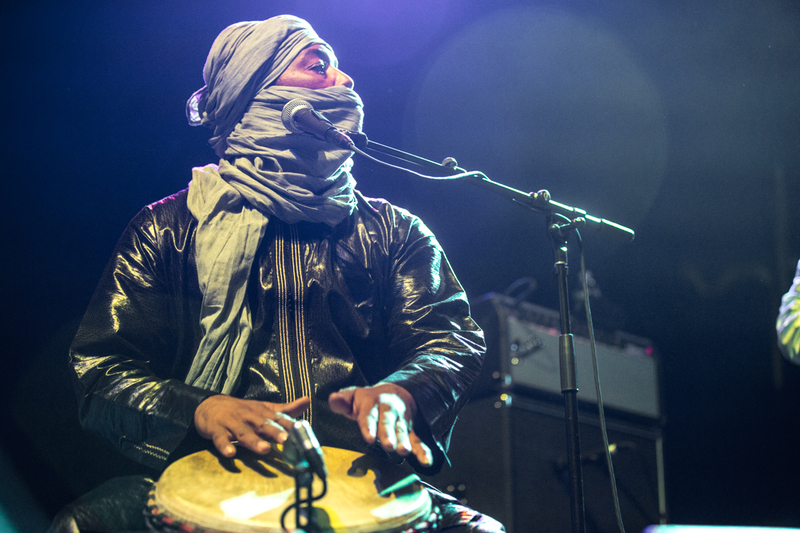 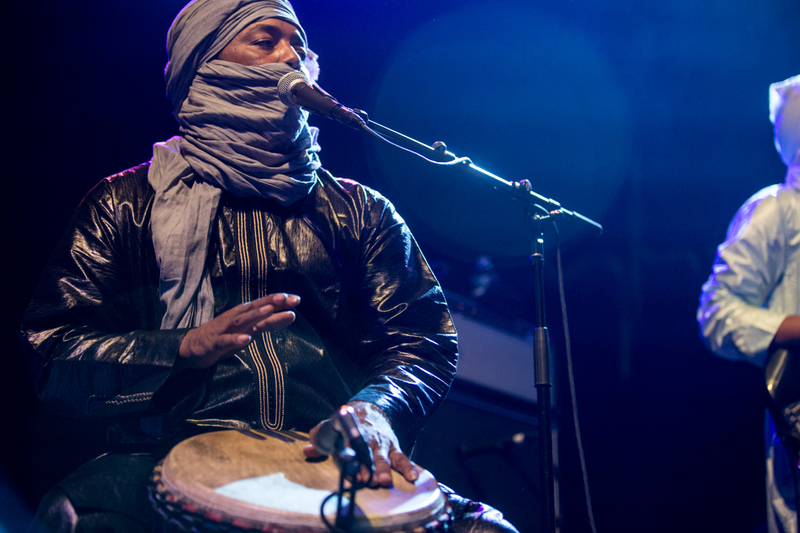 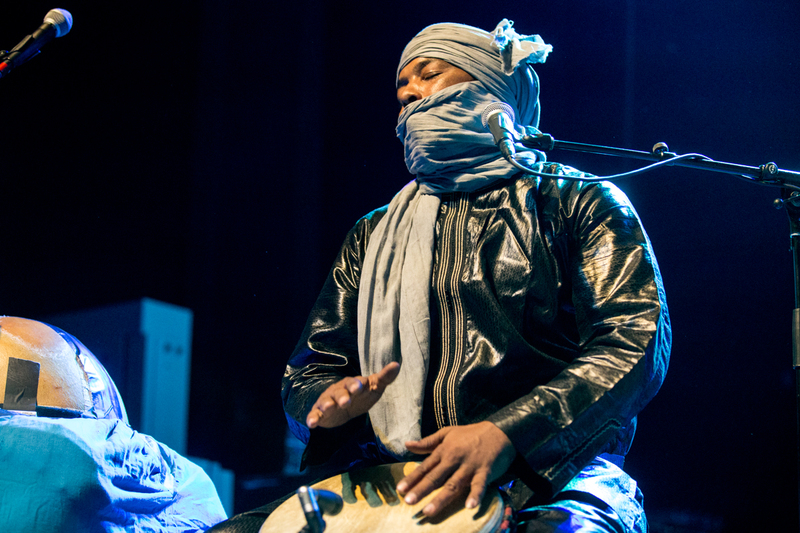 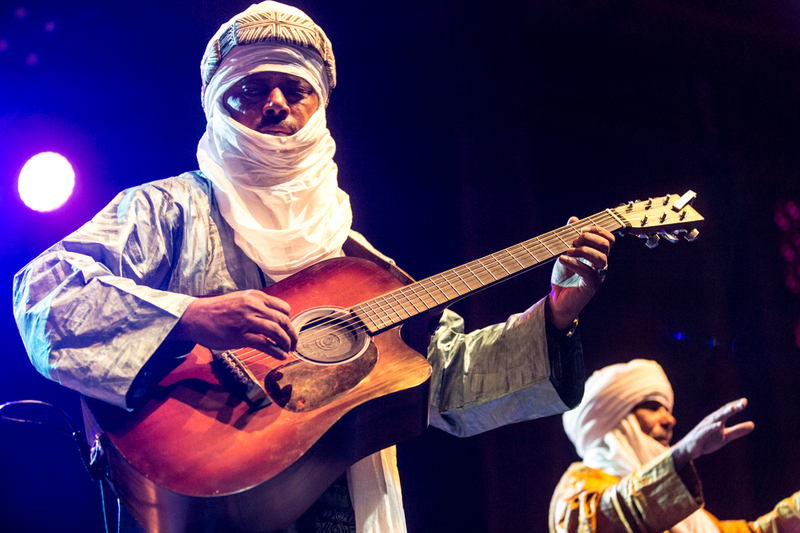 While simultaneously celebrating the gift of music itself and their Tuareg culture, their tone is also deeply heartbreaking, evoking a yearning pride for a homeland that is now a war zone. 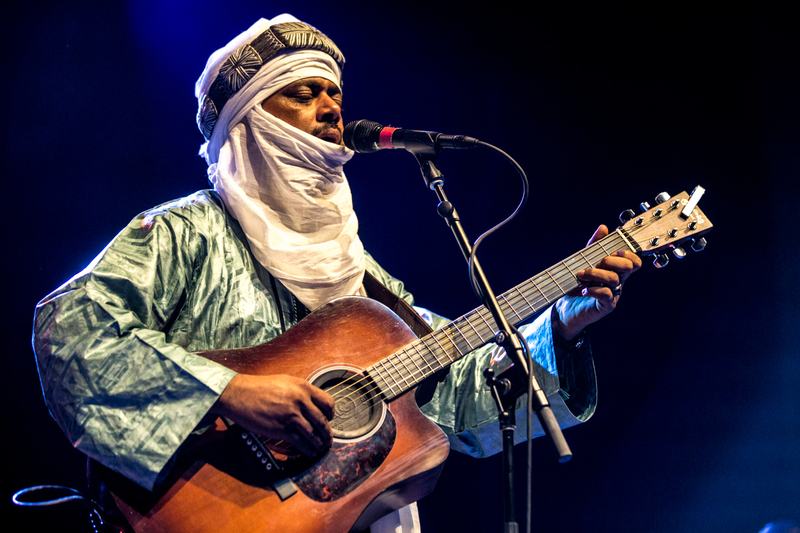 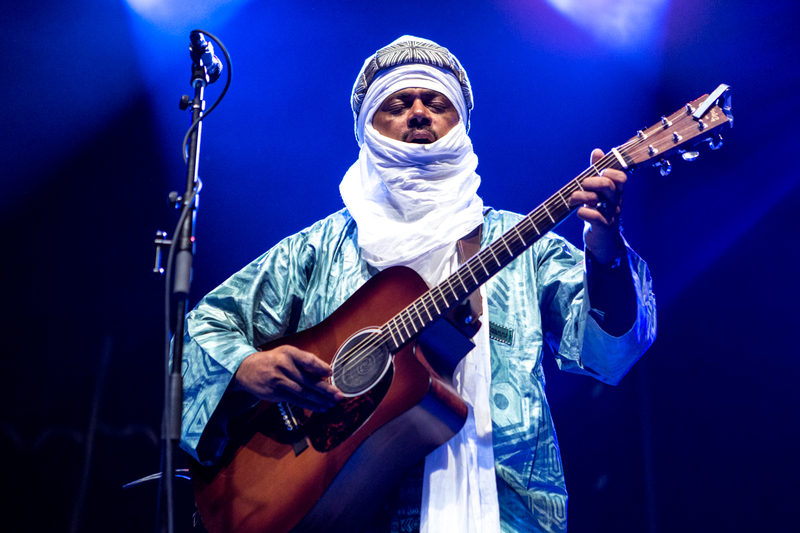 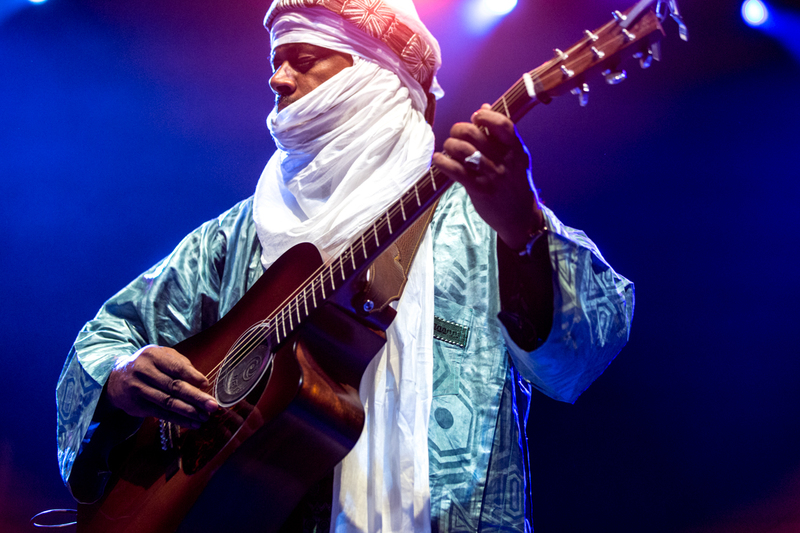 Being able to witness and appreciate Tinariwen is like paying homage to the beauty of a culture that is being kept alive by its proud sons who can no longer call it home, and for a moment, you feel like you can imagine the rich and complicated atmosphere that created these powerful musicians. 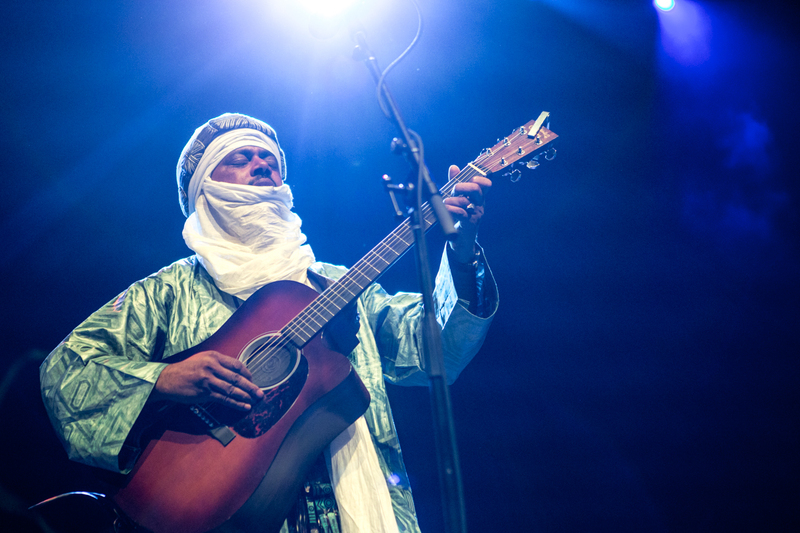 Then a new waft of weed hits your nose, or you’re bumped into by someone loudly exclaiming in multiple languages how good the show is- back to reality. 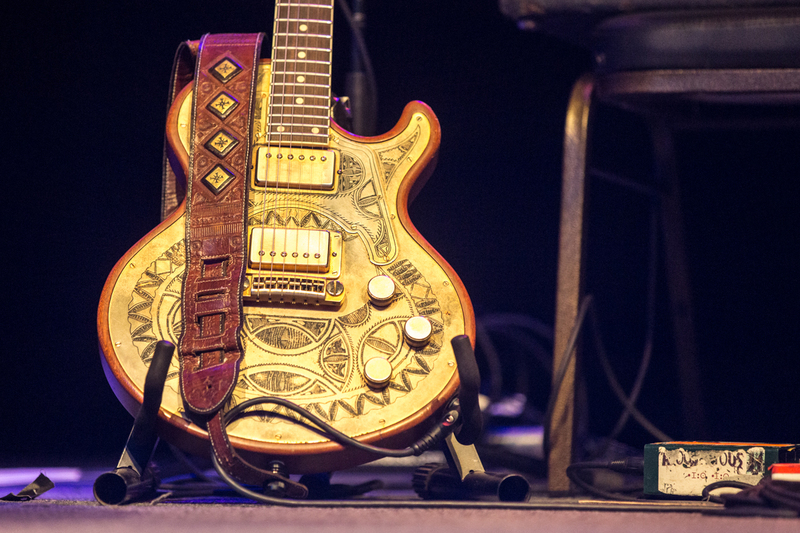 At least, until the next jaw dropping solo from any of the 3 guitars onstage.